I don’t know about you, but when I was growing up back in South Africa, Sunday lunch was A Big Deal in our house. It seemed that all my friends’s families had some sort of tradition around Sunday lunch: this one’s family always braaied (barbecued); this one’s family always went out to lunch at the same family restaurant; or that one’s family had roast beef with all the trimmings every week. We didn’t have the same thing every week, but we certainly had a disproportionate number of roast chickens with chasseur sauce on the side; and it was the only day that we ever got dessert at lunchtime as kids. And even when my brother and I were teenagers and saw our parents only in passing as we returned home from parties or rushed off to lectures, we knew we were both expected to show up for Sunday lunch, hangover or not! It’s a family tradition that I treasure to this day, and I often wonder if kids growing up these days have anything similar, a familial social anchor in an often stormy world. My parents are no longer around to punctuate my weeks with the steady bass drum beat of Sunday lunch, but that’s not to say that there aren’t places in London that understand the simple ceremony of Sunday lunch. I was recently invited to try the Sunday lunch special at a restaurant that I must have walked past many times without every noticing, the Chop Shop on Haymarket. The restaurant is part of the New York based Altamarea Group which already boasts a slew of New York and New Jersey restaurants, and the New York pedigree is evident as soon as you walk through the door. Spread over two floors, the restaurant features retro pendant cage lights, exposed brick walls, distressed dark wood panelling, and an impressive collection of large reclaimed tiles. The vibe is definitely urban shabby chic and 75% of all materials used in the design are reclaimed/repurposed. The beautiful bar on your left as you walk in looked as if it had been lifted straight out of a northern Portuguese village, and that the medronho bottles had only recently given way to the artisan gin bottles. There’s also a whitewashed brick wall with carving knives in cleavers embedded in it…! During the week, the menu features lots of things in jars (like crab cocktail or duck liver mousse) or on planks (cheeses and charcuterie) to share as starters, followed by a greatest hits selection of dishes from Altamarea New York City favorites, including Morini Meatballs, the Patty Melt Burger Sandwich, and hybrid dishes like the Cottage Pasta Pie (basil gnocchi pasta, braised oxtail, Parmiggiano – what’s not to like??). There is also a fine selection of carefully chosen steaks and chops, from USDA hanger steak to a Barnsley lamb chop with roasted fennel, as well as indulgent desserts (think brownie Sundae and sticky date pudding). But on the Sunday we visited, when the excesses of Friday and Saturday night had taken their toll on our cognitive abilities, we put on our sunglasses, tossed the menu aside, and ordered the Sunday rib chop special. This is the Chop Shop’s take on a traditional roast dinner, but jazzed up for a contemporary audience. For £35 per person you get their signature beef rib chop; roast with beef jus; roast potatoes; your choice of side dish; and half a bottle of wine. 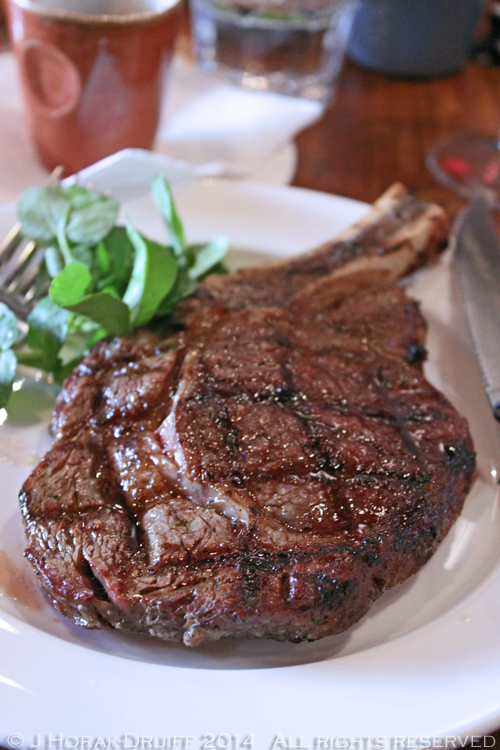 I am a massive fan of a beef rib chop and it’s not often that you see them on the menu – and what arrived was an utter delight. Beautifully charred on the outside; perfectly pink on the inside, and meltingly tender and juicy, the beef rib chop was not only enormous – it was also carnivorous perfection on a plate. Serving it simply with jus allowed the essential flavours of the meat to shine through – I never do understand why you’d smother an excellent steak with sauce. 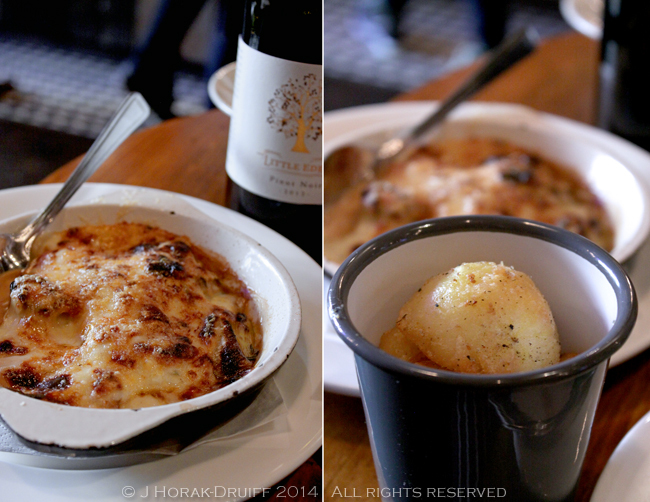 The roast potatoes were piping hot, crispy on the outside and fluffy on the inside (a level of perfection that I can never attain), but the most decadent thing on our table was definitely the baked cheesy leeks under their blanket of cheese and cream. 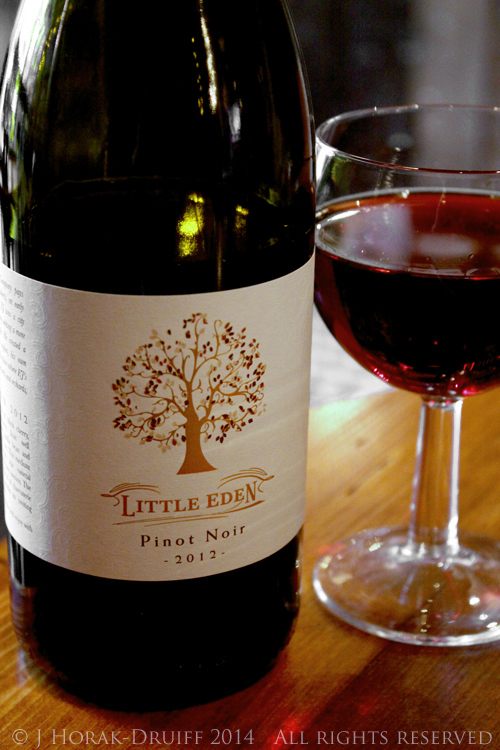 And to wash this down, we shared a bottle of 2012 Little Eden Pinot Noir , a surprisingly full bodied example of pinot packed with with spicy red fruit and soft, supple tannins. There was no rocket science going on at our table – just excellent, carefully sourced ingredients cooked unfussily to showcase their natural talents. And despite the achingly trendy decor, staff are as far from snooty as you can get. The restaurant wasn’t very busy at the time we visited, so we spoke to quite a few of them and they were all super-enthusiastic about the restaurant; and super-knowledgeable about the sourcing and cooking of ingredients. For those in need of a pick-me-up there is also a good house cocktail selection including the Haymarket (a reworked version of the Manhattan) and the Passione Arrabiata (a blend of chilli tequila, reposado tequila, passion fruit and lime). Whether you are stumbling blearily out of a club looking for a Sunday morning pick-me-up before heading home, or whether you’ve come to London to spend a Sunday exploring the city, there is no better way to kick off proceedings that with a the Chop Shop rib chop lunch. 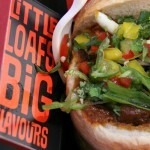 DISCLOSURE: I enjoyed this meal as a guest of the Chop Shop but I received no further remuneration to write this post. I retained full editorial control and all opinions expressed are my own. 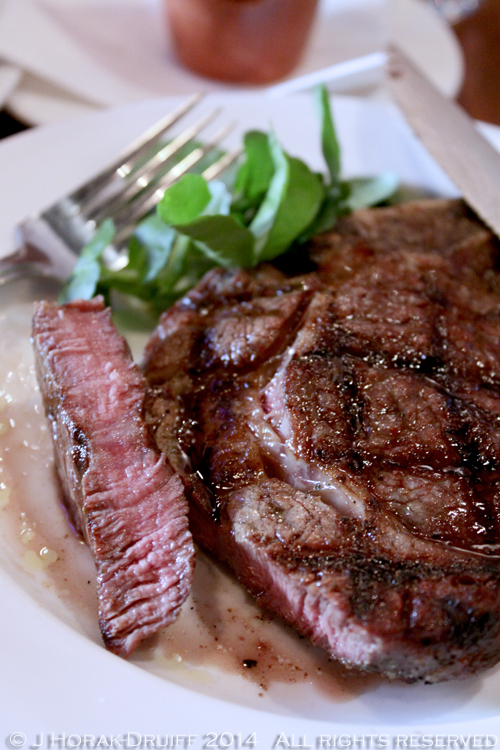 The beef rib chop looks sooooooo juicy – but even more so I fancy the baked leeks. The Chop Shop sounds like a good place to check out. Hmmmm, I’m trying to remember. I think on Sundays we usually just went to eat out in restaurants! I think I’d like to visit Chop House for the sole purpose of just trying the cheesy leeks. I don’t know what I want more: the rib chop, the pinot noir or the barman’s beard. Mine never fills out so darkly. I’m thinking he might use eyebrow pencil. The name of this place, plus it being a chain, would have made me walk past too. Certainly can’t always judge by first appearances – sounds like a great place for Sunday lunch. This looks heavenly! I love the “family social anchor” too, I do hope I can make that for my children. I adore Sunday lunch. Adding this to my list of places I need to visit..